The Blog of Dr. T. Michael W. Halcomb: Sponsor A Child: For Free!!! Now, you might think that title's misleading but actually, it's not! Today, I figured out a way to sponsor a child for $35 a month without having to budget out that $35. Essentially, I have found a way to sponsor a child at no cost. What do I mean? Well, when you sign up for or own a Mastercard, you can also sign up for their free rewards program. One of the great rewards programs they have is called "Cash Rewards." For every cent you spend with your card, you earn money back. Recently, when I checked on our rewards program, I saw that in the last year, we earned $400 in cash. That is enough to cover about 11 & 1/2 months worth of sponsoring a child! If you spend a little more and bring your rewards earnings up to $420, you can sponsor a kid for free with your earnings. You can withdraw these earnings monthly or annually or whenever you need to make your donations. That's right just by shopping, paying your bills and spending, you can sponsor a child. This is amazing! Imagine if everyone who owned a Mastercard in the United States did this; we could get every kid in Ethiopia (and probably more!) sponsored, fed, clothed, educated and cared for. 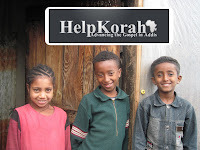 Realizing this, my wife and I who just adopted from Ethiopia and who sponsor 2 children already through Compassion International, have decided to sponsor a child through the HelpKorah Child Sponsorship Initiative with Transformation Love. Additionally, I'm wondering what creative ideas do you have come up with (or might you have) to raise funds for sponsorships?